When Mike Wilson and Megan Hanneman decided to drop by the Humane Society of West Michigan one day in April, they didn’t expect to leave with a new pet. 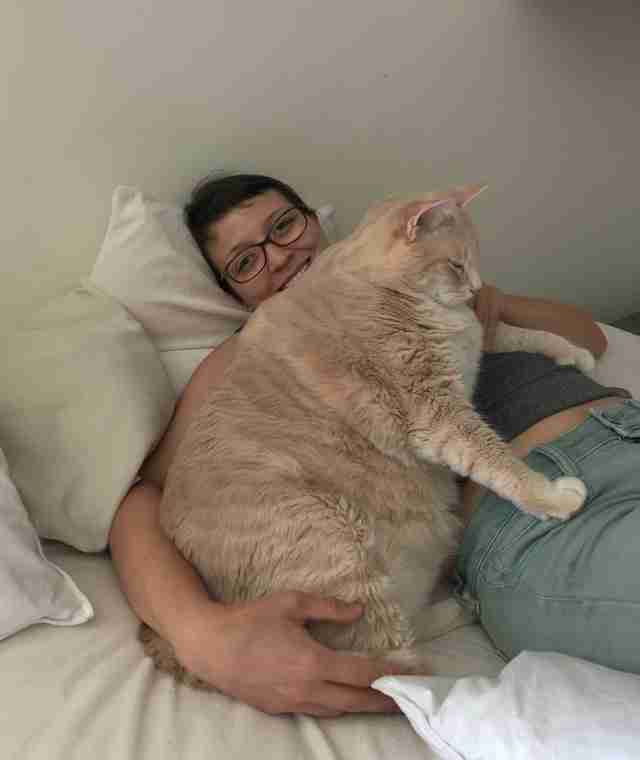 The couple had been discussing expanding their family with a kitten, but when they spotted Bronson — an enormous, 3-year-old orange cat weighing a whopping 33 pounds — it was love at first sight. Bronson struck quite an imposing silhouette among the other felines at the shelter, and the couple couldn’t help but be impressed. Wilson and Hanneman waited in line to be interviewed so they could meet Bronson, but had to leave for work before they were able to sit down with the shelter employee. 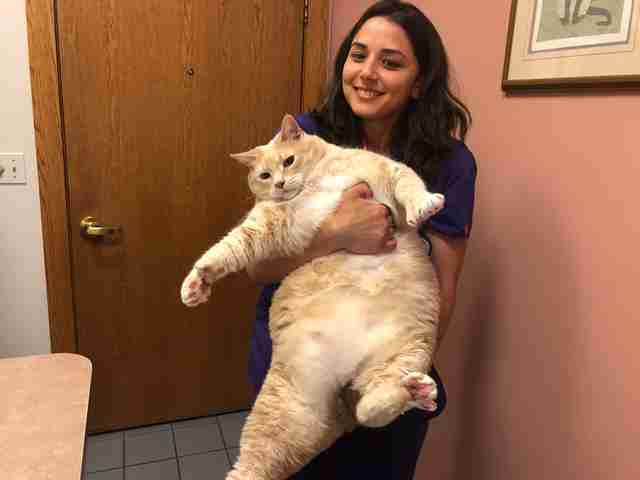 Still, they couldn’t stop ogling the snapshot they had taken of the enormous cat before they left. “On the way to work, we were talking about him nonstop and started regretting not sticking around for him,” Wilson said. As the day wore on, the couple’s fear that Bronson would be adopted grew, so they rushed back to the shelter as soon as they could. 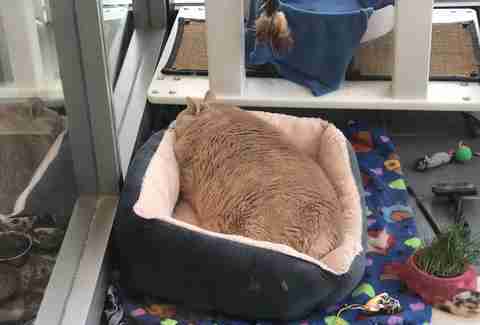 Bronson had come to the humane society after his elderly owner passed away. 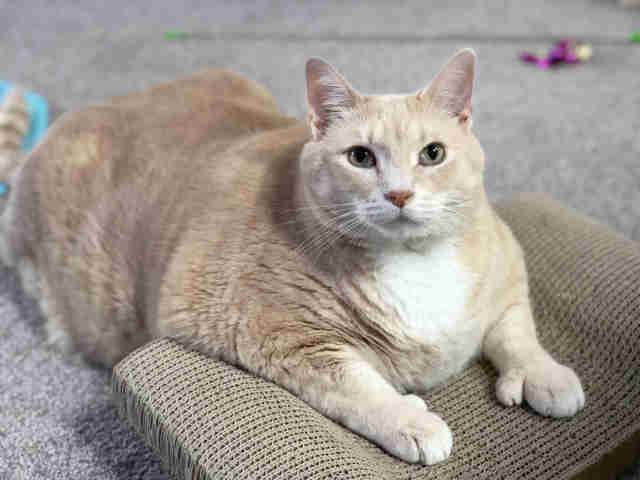 Shelter workers were told that he was called “Fat Kat,” and that though he had lived in a home with multiple pets, he was a bit of a loner and always kept to himself. No one was quite sure how such a young cat had gained so much weight. At Bronson’s size, he stood an increased risk of cancer, heart disease and diabetes, along with many other health complications. The interviewer warned the couple that Bronson’s eventual adopter would need to help him lose weight at a slow pace through diet and exercise. The young cat’s hefty measurements also made it difficult for him to adequately clean himself, so they would need to brush him daily to help keep his backside clean. When Wilson and Hanneman finally met Bronson in person, they were shocked by how love-hungry the cat was, seemingly desperate for pets and affection. And though their hands were oily after touching his striped orange fur, the couple knew they had to bring him home. While Bronson may not have been social in his past life, at his new home, he enjoys hanging out his two cat siblings. His companions have, in turn, encouraged Bronson to explore the house and play with the toys littered about each room. And his owners couldn’t be more happy to see the once-shy cat come out of his shell. Though Bronson hasn’t yet slimmed down significantly, in the care of Wilson and Hanneman he’s well on his way to becoming an active cat once again. The couple, who build wall-mounted furniture designed to help promote exercise for indoor cats, hope that one day Bronson will be able to enjoy their creations. Once Bronson has lost enough weight to be able to safely take flea and tick medicine, he will join his parents for walks outside. “His life is going to look much different a year from now,” Wilson added. Everywhere Bronson goes, he attracts attention — not just for his size, but for his sweet, peaceful personality. 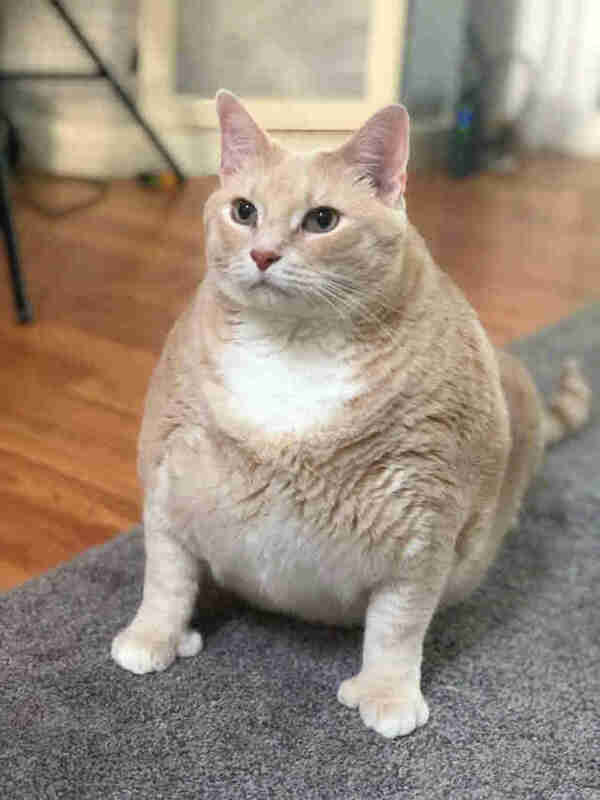 Even his parents can’t help but pet Bronson every time they see his big, cuddly body — though they have since discovered that even the cat who can’t get enough affection does have his limits. To learn more about Bronson’s weight loss journey, you can follow him on Instagram or check him out on Facebook.